Andrew’s thoughts: It’s tough writing trade reviews sometimes because, as an owner, I occasionally have information and context to a trade or a player’s asking price behind closed doors that doesn’t really seem fair to publicize. That is true in this case. So I’ll be careful not to share how the information that I have influences my perspective of this trade. Let’s just say that I know what the asking price was for Bryce Harper, like, yesterday, and move on. First of all, both these players are really good and quite valuable. 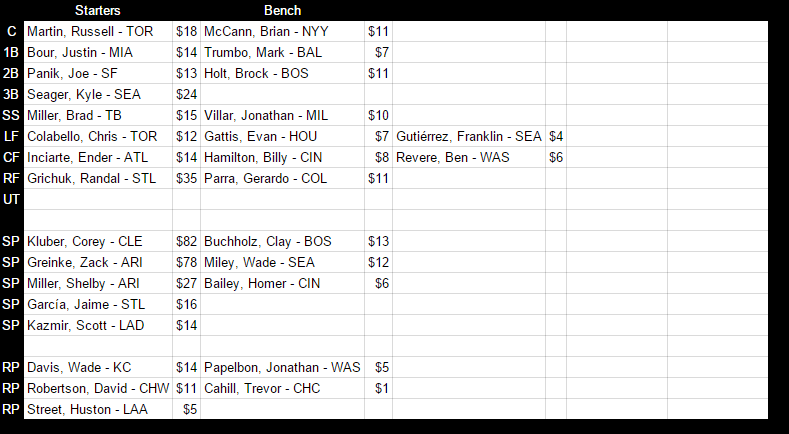 I love Bryce and would give up essentially my entire team for him, $111 in 2017 be damned. I also love Greinke and at $78, he’s priced very well. 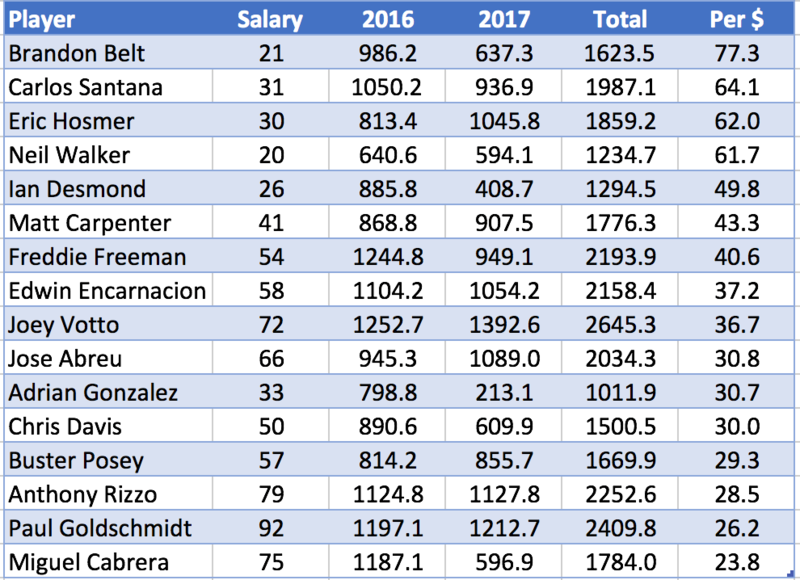 He’s had a slow start to the season, but he truly is an ace of staff — and on the Oysters, joins Jake Arrieta and Max Scherzer in a horrifying trifecta of pitchers — that even at $80 next year doesn’t seem like a problem to keep. I think my problem with this trade, as with Dusty’s first Bryce trade, is that pieces just seem to be lacking. The 1-for-1 is nice, simple, clean. And Bryce being traded three times suggests teams are scared of his salary. But I really don’t understand how you trade a transcendent, once in a lifetime talent twice and each time only get back a single pitcher. And you guys know how I feel about the value of pitchers. I just really feel like value is being left on the table. 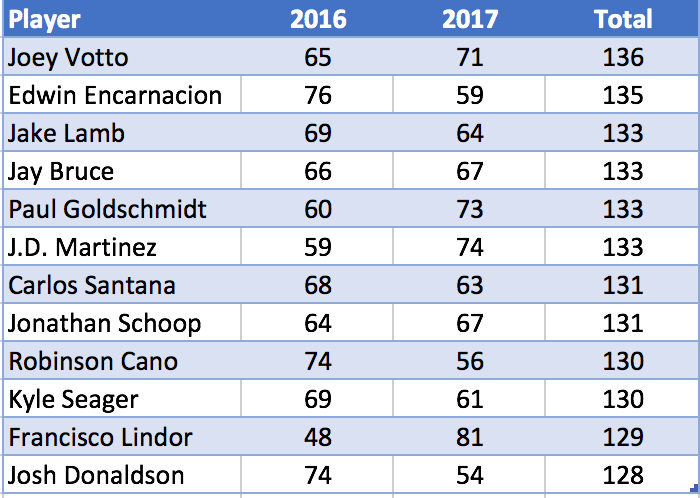 I mean, Greinke is awesome and you could argue the top 8-10 pitchers or so make a greater difference to a team’s success than the top 3-4 hitters do. But how does Dusty not pry Dansby Swanson from the Squids here? How does he not get Hunter Renfroe and Carson Fulmer thrown in? How does he not get some draft pick conpensation? Is it that unreasonable to also get Mark Trumbo or Kyle Seager back? Something else?! Truthfully, I don’t hate the deal for either side and both teams may come out feeling alright. I just think, as Dusty does pretty regularly, the haste to get a flashy deal done quickly got in the way of sapping the most possible value out of his asset. And who knows, a week or two from now if Dusty’s great-on-paper squad keeps underperforming, maybe he’ll turn around and start unloading Arrieta, Scherzer, and even Greinke and just reshuffle the deck that way. Though this is twice now that Bryce has been traded for the bare minimum, so I would hope our stable of owners here are savvy enough to recognize that there’s a pattern here. Just wait it out, and eventually you can buy guys from the Oysters for a price that suits you best. I don’t mean to beat on Dusty (again). I love that he can unleash those three aces on his opposition, plus deploy Kyle Hendricks and John Lackey on weeks where those guys only start once per week. But even that, I think, leads to an interesting point: how much pitching is too much, even in a format where they’re super valuable? I mean, isn’t having those five starters, plus quality arms in Collin McHugh just a big opportunity cost problem? In other words, did Dusty’s roster need Harper’s offensive production more than it needed Greinke? I think it probably did. To date, the Oysters have been the second worst offense in the league… with Harper. Dusty’s offense is now dramatically worse. I think another trade pretty much has to happen, and at what point are you chewing into values by making a thousand moves just to end up in roughly the same spot? I don’t know. This deal is exciting and I love the rotation Dusty’s assembled, I just feel like Squids got off light here. Jordan’s thoughts: Andrew just wrote so beautifully. I know RMO could have gotten more. I know that Squids wasn’t getting more. Another head scratcher. I just have to shake my head and move on. There’s no reason here why Squids would say no to getting Bryce. There’s no reason Dusty should only ask for Greinke for Bryce. None. There’s been plenty of lopsided deals, but even at $111, Bryce is a value keeper piece next year. Just crazy. After taking a beating for making a trade with super trader Dusty, Squids came out hard and furious and drafted pretty well. It’s clear that this team has serious potential, but there’s a few question marks. Is Randal Grichuk really worth $35? At least two people thought so. Was Shelby Miller good last year or lucky? There is nobody in this line up for the Senior Squids that week in week out is reliably going to carry you. This line up is not that different that Capital City that we saw earlier, except it is missing the Votto/Miggy connection. Great at the catching position, and I like Joe Panik and Kyle Seager. Obviously I love Brad Miller, but prefer him to not be forced to slot at short stop. The outfield is alright, but is Grichuk a top 5 outfielder? Between the eight outfielders, he should be able to stream a solid 3-man outfield, but even their ceiling isn’t terribly high. Justin Bour at first base could be solid, or was last year as good as it gets? This was one of the harder ones to classify. It’s on the bubble of Very Good and Great. Corey Kluber and Zack Greinke are amazing. Tier one for starting pitchers is probably truly two sub tiers, the unreal good guys and the other good guys relative to the entire pool. Kluber and Greinke are elite. Shelby Miller got chastised for getting traded to Arizona for a king’s ransom, but in fantasy not much has changed. It is not hard to imagine that out of Jaime Garcia, Scott Kazmir, Clay Bucholz, Wade Miller and Home Bailey that you can string four comfortable starts out of the group weekly. Likely two of those guys end up being traded for more hitting. Also for the first time during this review exercise, the bullpen here is great. Wade Davis and David Robertson are primed to be great. While that can change in a week, it is hard to argue with the values he spent and assumed to receive here. I like the rotation depth a lot. I like the outfield depth that all suffices to cover both utility spots just fine. Brock Holt and Brad Miller can play so many positions. None of his starting hitters are good enough to sink this team if they get hurt, and he already has built in serviceable starters at every position. Although replacing Kyle Seager would hurt the most, and not just because I’m a Mariners fan. Well, while the Squids could theoretically afford to lose both Greinke and Kluber to some scary injury and survive, the back end of the rotation is presumed to be good enough. However, the line up just is not. He needs the 100 points a week from those two aces each week. Even then, the ceiling for this team’s scoring just seems destined to be too low. Things are great for the Senior Squids if Kluber and Greinke pitch themselves into Cy Young conversations in their respective league’s again this year. The rest of the starters shake out in some good way. Perhaps there’s a hitter here that breaks out and jumps into the top 5 of their position that I’m just not seeing. Mark Trumbo reclaims some of his sheen in Baltimore? There’s lots of options here for things to go good, and that’s a good thing.